Y’all, there’s no more magical place during the Holidays than New York City. The lights, the decorated store windows, the Rockefeller Center Christmas Tree, the Rockettes….I’m feeling jolly just thinking about all the fun…but you know what’s missing? REALLY good Christmas Cookies! A few years ago, I took my kids to NYC for their first time. We had a ball running around seeing all the sites, but my absolute favorite experience revolves around a cookie…a Christmas cookie! Get out your map, and spread it out on the kitchen table. Am I dating myself? 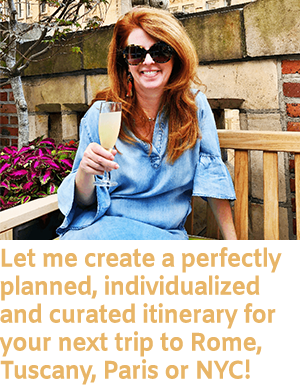 OK, open up your app…and find Bleecker St. and 6th Avenue, in Greenwich Village. Bleecker Street is a GREAT street in NYC rich in history, and I’ll do a post soon about all the fun you can have just strolling down Bleecker. Anyway, walking west on Bleecker, once you cross 6th Avenue, you are in the heart of Greenwich Village, and there’s a number of fantastic Italian bakeries in this area. My personal favorite, is Rocco’s. Rocco Sr. started on his American Dream when he left his native Italy for a new life in NYC when he was 16. He arrived on January 1, 1957 and started working as a dishwasher in a bakery in the West Village. 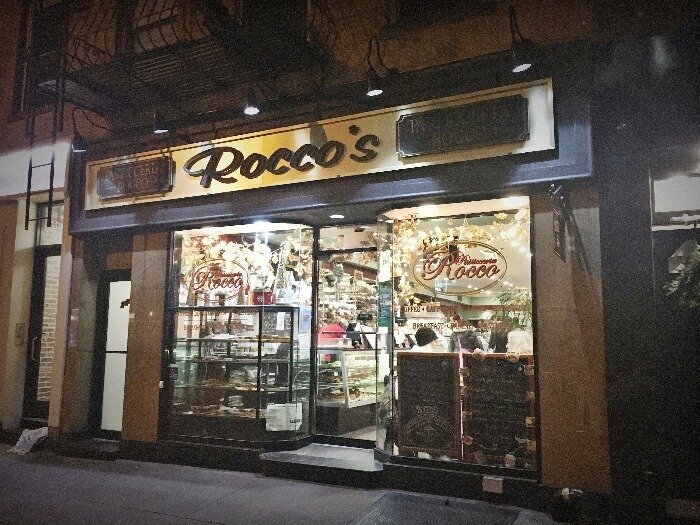 Few years later he became a head pastry chef and eventually bought the shop on Bleecker Street in the West Village in 1974. In 2010 Rocco Sr. retired, leaving his children to carry on that dream. 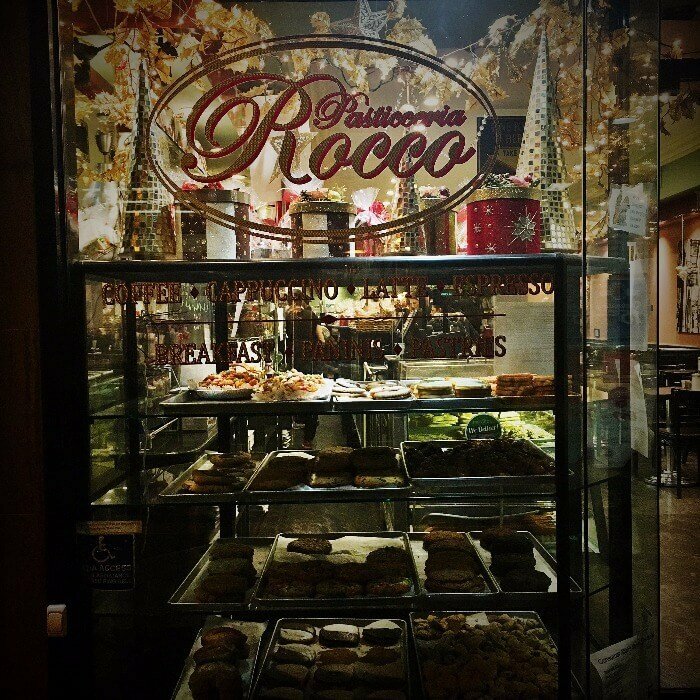 Rocco’s offers so many kinds of Christmas cookies, and the brightly lit cases are a feast for the eyes. 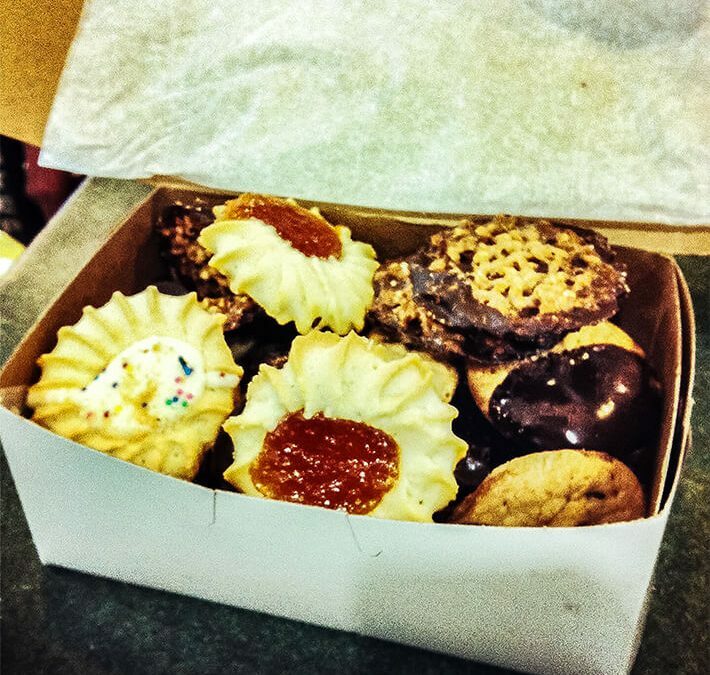 Select your favorites, and the staff will tie up your cardboard cookie box with their signature red and white twine. 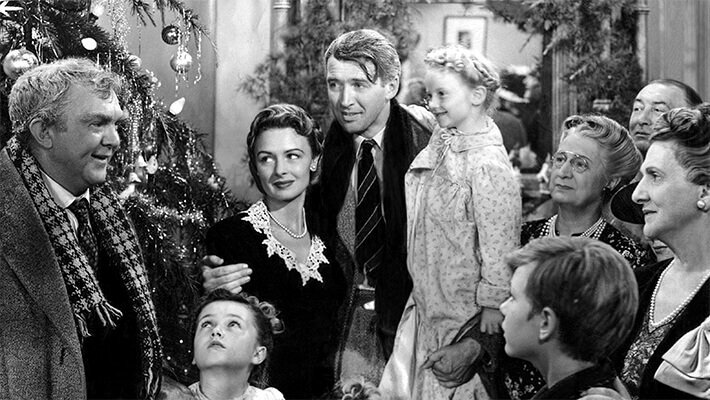 Now, walk back to 6th Avenue, turn left and walk up a short block to the IFC Center movie theater, well-known for screening independent and unique films, tuck your cookie box carefully away, and purchase a ticket to the Jimmy Stewart classic, It’s a Wonderful Life. Yes….I know you have seen this film a million times on the TV, but I promise y’all….there’s no substitute for seeing Clarence and George Bailey on the big screen, while you happily much your way through a box of Rocco’s Christmas cookies. This is a wonderful activity for kids, or kids at heart. Christmas Cheer in high gear! Hoping everyone has a Holly Jolly Season!!! If you need to kill time before the movie starts: There’s a tiny little park at the corner of 6th and Bleecker St. called Father Demo Square. There’s a fountain in the center, and lots of benches to rest your weary feet! Sometimes, closer to Christmas, a group of carolers will gather and entertain everyone in the Square. A very special holiday treat! Be sure and follow @shopbleeckernyc on Instagram! 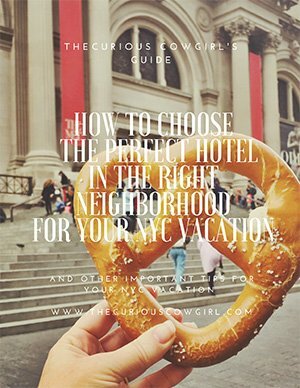 There’s always some great sales and promotions going on, and you will be always in the loop with what his hip and happening on Bleecker St.
For more Christmas Cheer, or to simply stretch your legs after the movie, walk up to Washington Square Park by walking one block North on 6 Avenue, and taking a right on 4th Street! There’s a wonderful Christmas Tree there, and if you stand in the right spot, you can see the Empire State Building in the distance, framed beautifully by the Washington Square Arch! 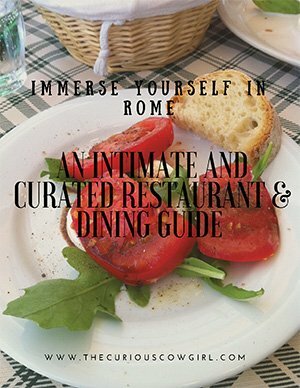 My NYC Restaurant Guide is only $10, and has over 30 restaurant suggestions, organized by part of town, and includes phone numbers, and information about those that participate on Open Table. Worth every penny y’all!!!! Looking for more NYC Christmas Cheer? Check out this post! Thank you! 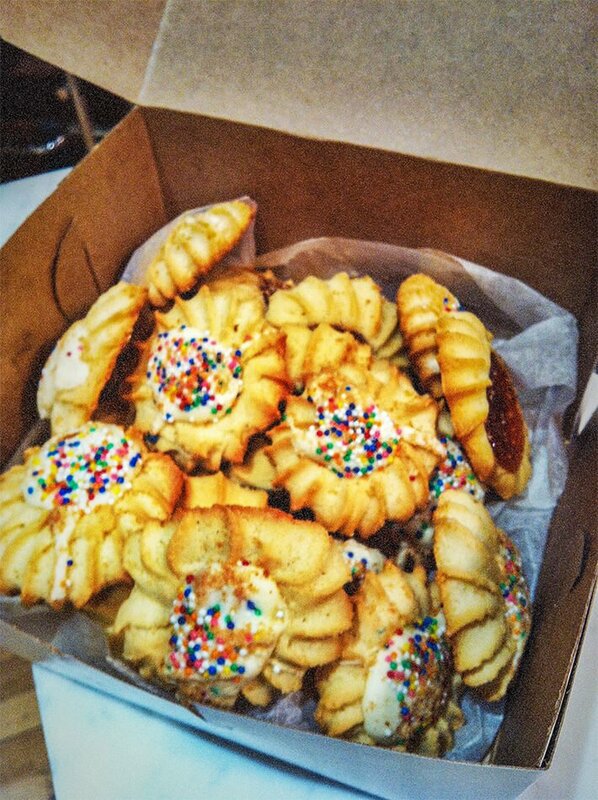 We sure do love those Roccos cookies!!!!!! Great job, Mary Elizabeth. I’ll Share it. Thank you, good friend, for your understanding of those of us who can’t “do” the cyber-world very well.